In 2010, close to 150,000 homeless pets were admitted to shelters. Thanks to the efforts of caring workers and volunteers, a good number of these animals were either returned to their owners or placed in new homes; unfortunately, far too many were not. The Canadian Federation of Humane Societies (CFHS) represents humane societies and SPCAs that shelter animals in need. In addition to providing physical care of animals who pass through their doors – and undertaking gargantuan efforts to find them new homes – the CFHS works to promote respect for and humane treatment of all animals and is Canada’s national voice on animal-welfare issues. Design Manager Danielle Trottier, herself a long-time pet owner, wanted to ensure that this stamp design not only called attention to the plight of homeless pets in Canada and the work of organizations under the CFHS – but also educated the public about shelter animals and encouraged their adoption. “Members of the Stamp Advisory Committee noticed how the design invited interaction – which is a great way to get people engaged in the topic. Detaching the stamps from the backing allows you to let the animal out of the cage or kennel – and hopefully send it on route to a good home.” The background sketches each animal’s dream of home. 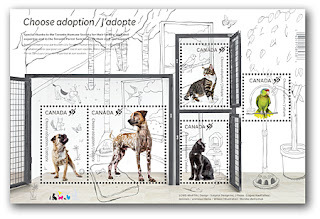 The animal models for the stamps were actual shelter animals and names and individual experiences are included in the stamp booklet and on the Official First Day Cover story. The primary message of this issue is to inform Canadians that when they look for a pet, their first stop should be their local humane society or SPCA. There was also a need to dispel the myth that shelter animals are poorly behaved animals, that their original owners couldn’t deal with them. On the contrary, most ended up homeless because their owner got them on impulse and weren’t aware of or prepared for the investment they would require in time and money. In some cases, the owner died and there was no one else to adopt the pet. Failing to spay or neuter pets can also bring unwanted litters. Most shelter animals simply need a second chance. Did you know that they come with several benefits? They’ve been spayed or neutered, micro-chipped, vaccinated and had a full vet check-up. Their physical health and behavior has been tested to ensure they’re ready for a new home. Pet parents who adopt from a shelter can choose the kind of animal they want. They not only get a new best friend and a lifetime of love, but also may be saving a life.